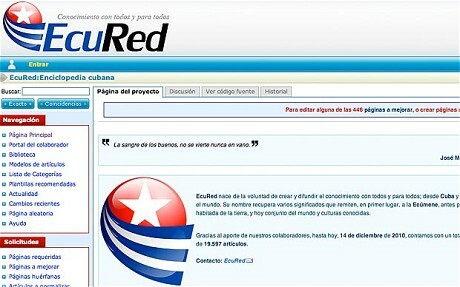 Cuba recently launched its very own "version" of Wikipedia, called EcuRed. In EcuRed's entry on the U.S., for instance, the site notes that America has taken "by force territory and natural resources from other nations, to put at the service of its businesses and monopolies." Presidents gazed longingly at fertile, delicious Cuba "like those who admire a beautiful fruit that will end up falling in their hands." While my Spanish is rusty, I imagine this is about as impartial and informative of a source as Conservapedia. "The List" for those who for some strange reason does not know them, are lists of mailing addresses that were created a few years old with the aim, in the beginning, to announce the purchase, sale and exchange of hardware typically used . 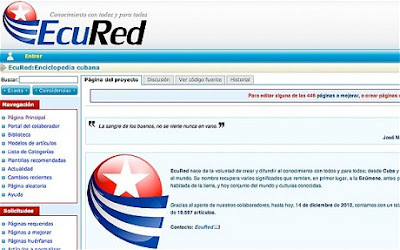 It was a way to support the "homebuilding" or the eagerness and curiosity characteristic of the Cuban, to enter the world of computing in a more informal and less institutional. This trend was growing, and it was not just hardware, more and more people had access to Email, today will announce many things, and a few of us who rely on this handy tool for everyday life. In the most natural I think an active and cooperative community, which functions as a single body, governed by the collective intelligence and mass. Each and every one, protect our interests and therefore the group, so it is not surprising that when one or two have wanted to come to mess noise in the system and discuss politics, religion or any other troubled topic, have not place and most have responded.No statutes or rules defined, everyone knows what can and what not. Meanwhile, China has launched its own "version" of Twitter, called "Red Microblog" to dispense handy Chinese Communist Party slogans and encouraging words from Mao in an effort to counter public dissent on the internet. "The era of the microblog has hit China," said Dr Steven Dong at the Global Journalism Institute at Tsinghua university in Beijing. "This would not have been possible two years ago, but the Olympics, the Shanghai Expo and the Guangzhou Asian Games have affected China's politics, economy and culture," he said. "This is a good platform for discovering and spreading news about mass incidents," he added, although he noted that newspapers are still more trusted. According to EnfoDesk, a Chinese analyst, there will be 75 million microbloggers in China by the end of 2010, an 837 per cent increase from last year. The firm estimates that the number will double next year and then to 240 million by 2012. The lesson here for authoritarian regimes? If you can't beat the free market capitalists' new fangled "social media" programs, then join 'em...Like Hugo Chavez.